When he was in his thirties, Kandinsky got serious about art. He abandoned his law background and went to Paris to study art. It was 1900 and the arts were popping, all of them, in all forms. In literature, music and painting new forms were being invented, radically new ways of thinking about art were discussed in the cafes. I mentioned some artists and writers in the previous post. In science, too, let’s not forget, radically new ways of thinking about time and space were under discussion. Einstein published his theory in 1905. This is the beginning of our modernism, which was not at all entertaining, but deadly serious about leading humanity into a new consciousness. The moderns wanted nothing less than to invent a new man. One of their ambitions was to intensify our perception of the world by fusing the senses. So that, for example, sound would be seen and paintings would be heard like music. Schopenhauer, already in the early 19th century, had said that all art aspires to the conditions of music. This is not hard to understand. Think about it for a minute: music does not imitate anything; it is sound that is non-representational, is freely invented; the sounds we hear in nature come from birds chirping, leaves rustling in the wind and doors creaking, but music doesn’t duplicate those sounds. The composer/musician makes things up. Music is pure form. It’s abstract. It’s also the most moving of the arts. Grabs us, makes us cry, makes us dance. p. 19 Despite, or perhaps thanks to, the differences between them (the arts), there has never been a time when the arts approached each other more nearly than they do today, in this later phase of spiritual development. In each manifestation is the seed of a striving towards the abstract, the non-material. Consciously or unconsciously they are obeying Socrates’ command—Know thyself. Consciously or unconsciously artists are studying and proving their material, setting in the balance the spiritual value of those elements, with which it is their several privilege to work. And the natural result of this striving is that the various arts are drawing together. They are finding in Music the best teacher. With few exceptions music has been for some centuries the art which has devoted itself not to the reproduction of natural phenomena, but rather to the expression of the artist’s soul, in musical sound. P33 The adaptability of forms, their organic but inward variations, their motion in the picture, their inclination to material or abstract, their mutual relations, either individually or as parts of a whole; further, the concord or discord of the various elements of a picture, the handling of groups, the combinations of veiled and openly expressed appeals, the use of rhythmical or unrhythmical, of geometrical or non-geometrical forms, their contiguity or separation—all these things are the material for counterpoint in painting. P32 There is no “must” in art, because art is free. P19 (The painter) naturally seeks to apply the methods of music to his own art. And from this results that modern desire for rhythm on painting, for mathematical, abstract construction, for repeated notes of color, for setting color in motion. P53 The work of art is born of the artist in a mysterious and secret way…It exists and has power to create spiritual atmosphere; and from this inner standpoint one judges whether it is a good work of art or a bad one…A picture is not necessarily “well painted” if it possesses the “values of which French so constantly speak. It is only well painted if its spiritual value is complete and satisfying. “Good drawing” is drawing that cannot be altered without destruction of this inner value, quite irrespective of its correctness as anatomy, botany, or any other science. There is no question of a violation natural form, but only of the need of the artist for such form. Similarly colors are used not because they are true to nature, but because they are necessary to the particular picture. In fact, the artist is not only justified in using, but it is his duty to use only those forms which fulfill his own need. Absolute freedom, whether from anatomy or anything of the kind, must be given the artist in his choice of material Such spiritual freedom is as necessary in art at it is in life. P57 …in my opinion, we are fast approaching the time of reasoned and conscious composition, when the painter will be proud to declare his work constructive. This will be in contrast to the claim of the Impressionists that they could explain nothing, that their art came upon them by inspiration. We have before us the age of conscious creation, and this new spirit in painting is going hand in hand with the spirit of thought towards an epoch of great spiritual leaders. P54 Painting is an art, and art is not vague production, transitory and isolated, but a power which must be directed to the improvement and refinement of the human soul. P31 We may be present at the conception of a new epoch, or we may see the opportunity squandered in aimless extravagance. P12 That which belongs to the spirit of the future can only be realized in feeling, and to this feeling the talent of the artist is the only road. 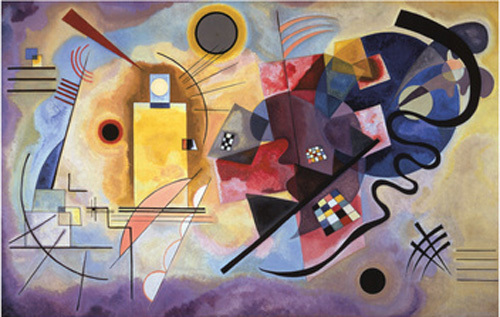 For excellent reproductions of some of Kandinsky’s paintings, see http://www.wassily-kandinsky.org/wassily-kandinsky-paintings.jsp Click the image for enlargement to study. 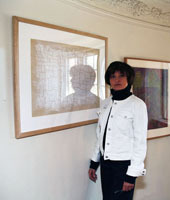 Elaine C. called this painting “Untitled” when she submitted it for the student show at the Evanston Art Center. There must be thousands of painting in the world by that name. That ”Untitled” is the best name for this painting becomes evident when you consider some alternatives. 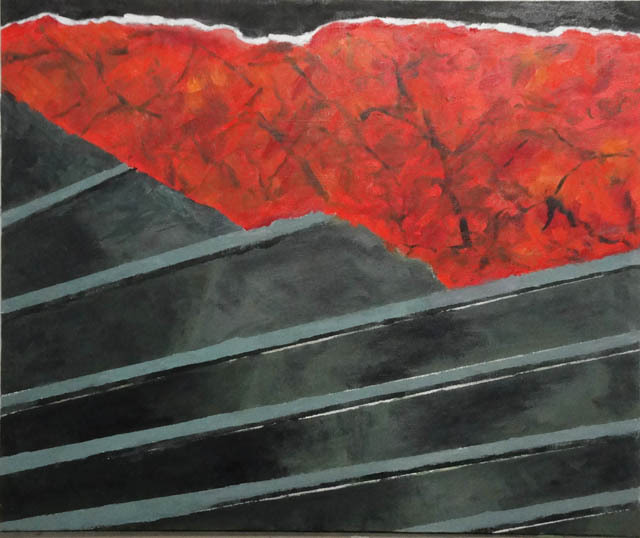 Since the painting was made in a class called “Impressions of Landscape,” she might have named it:Red Marble, Red Mountain in the Distance, Landscape in Red and Green, The White Horizon. Some artists name their paintings according to concepts or states of mind, such as: Orientation, Oder and Chaos, The Strait and the Crooked, Where Are We Going, Fissures. Schopenhauer said, “All art aspires to the conditions of music.” That’s a powerful statement. He’s saying that art is about form and experience. We don’t paraphrase or summarize a piece of music. We experience it. Granted some symphonies get nicknames, but generally they are known by their numbers. The Beethoven Fifth, the Mahler Fourth, et al. Elaine was wise in sticking to “Untitled.” She’s saying, look at it, contemplate it, experience it. The painting originated with a small collage, about 2”x3”. It was complicated to paint: the tuning of the reds and greens relative to one another; working with masking tape for the straight lines; the issue of clean edges vs. grainy edges; the illusion of a vanishing point outside the painting; the “marbling” (!) of the red. This painting strikes me as very musical indeed. It sets up a counterpoint between the red area with its texture and the celadon-green-black passage with its stripes. That’s as verbal as I want to get about it, though the technical details are interesting and were discussed in class in the context of desirable or undesirable effects. It doesn’t refer to anything or illustrate anything. It cannot be paraphrased. It exists as an object in its own right. I just want to look at it and let it absorb me.